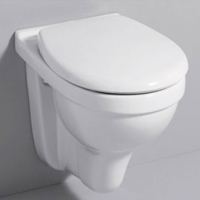 The Keramag Plus4 WC is 4 cm higher than conventional toilets and makes sitting down and getting up much more easier. This makes it especially suitable for older or disabled people. The higher toilet and the projection of 57 cm improve the sitting position and relieves the back. Thanks to KeraTect the ceramic of your Keramag Plus4 washdown toilet is particularly easy to clean and hygienic. The matching Keramag Plus4 toilet seat is also available from us.